LOS ANGELES, Sept. 28, 2018 /PRNewswire/ — Dr. Sanusi Umar, a Los Angeles dermatologic surgeon, has announced the release of two new, separate hair transplant tools to solve a matter that has vexed the hair transplant community. All aspects of surgery have trended towards minimally invasive procedures as more patients prefer discretion. In hair transplantation, the minimally invasive procedure is called Follicular Unit Extraction (FUE). It differs from previous techniques that result in a linear scar. When performed properly, FUE leaves tiny scattered wounds that heal into less visible dot scars, enabling shorter hair cuts. This is not typically possible with the older procedure, which leaves a noticeable line-shaped scar. While a majority of the world population has enjoyed this procedure, patients of African descent– particularly males who prefer shorter haircuts– have not benefited uniformly from this boon. This is because of skin and hair characteristics that render current FUE tools ineffective for most of this demographic. Some practitioners with experience in Afro textured hair FUE using conventional tools often acquire specialized methods that involve using larger punches, guessing hair bending and curve angles, and manual curve navigation while accepting a relatively higher graft attrition rate. Dr. Sanusi Umar announced two new, separate inventions (patent-pending), either of which offer a comprehensive solution to the Afro textured FUE problem. The provider now has a wider menu where no options existed, and faces less technical demands. One procedure uses a specialized rotary tool– The Intelligent Punch (patent-pending), mounted on a patented graft-hydrating and punch-lubricating system (Dr.UGraft™ Nurture handpiece). 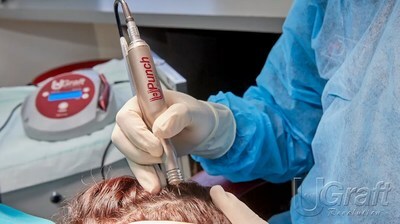 According to Dr. Umar, “The system is intuitive and comes with optimized settings, so the operator needs no PH.D in computer science to dial them in.” Used with the Dr.UGraft Nurture handpiece, the Intelligent Punch intuitively navigates graft angles, enabling safe extraction of grafts in all Afro textured hair FUE. Dr. Umar then announced the launch of yet another new invention– Dr.UPunch Curl 2.0 (Patent pending)– an unconventional non-rotary tool. This is an enhanced version of a previous invention – Dr.UPunch 1.0 ( European Patent 2939617B1). According to Dr. Umar, the new version is more user friendly. The punches are smaller, sharper and faster, hence its early release to other FUE providers. Less skill is required as guessing hair curving and bending angles is irrelevant. “Minimal effort is needed, and it is very easy to learn,” says Dr. Umar (aka Dr. U). An instructional video released by Dr. U reveals how both of these independent technologies work. Both tools are ready for purchase on the Dr.UGraft website. They are also available for the first time at the Los Angeles Hair Transplant Hands-On Cadaver Course this Oct. 6-7, and at the ISHRS annual congress in Hollywood, CA on Oct. 10-14 at Booth # 61. Dr. Sanusi Umar is a globally recognized dermatologic surgeon in Los Angeles. He is the founder of Dr. U Hair and Skin Clinic, Dr. U Devices and FineTouch Laboratories. He is also on faculty at the David Geffen School of Medicine UCLA, and the Director of Cosmetic Dermatology at the Harbor-UCLA Dermatology Department.